I love everything about the word “clean.” How it sounds, how it smells, and how it shines! I admit I probably have a bit of OCD, but that doesn’t bother me at al. My mom always taught us that a house, no matter how small and humble, will always feel like heaven when it is clean – and I agree 100%. 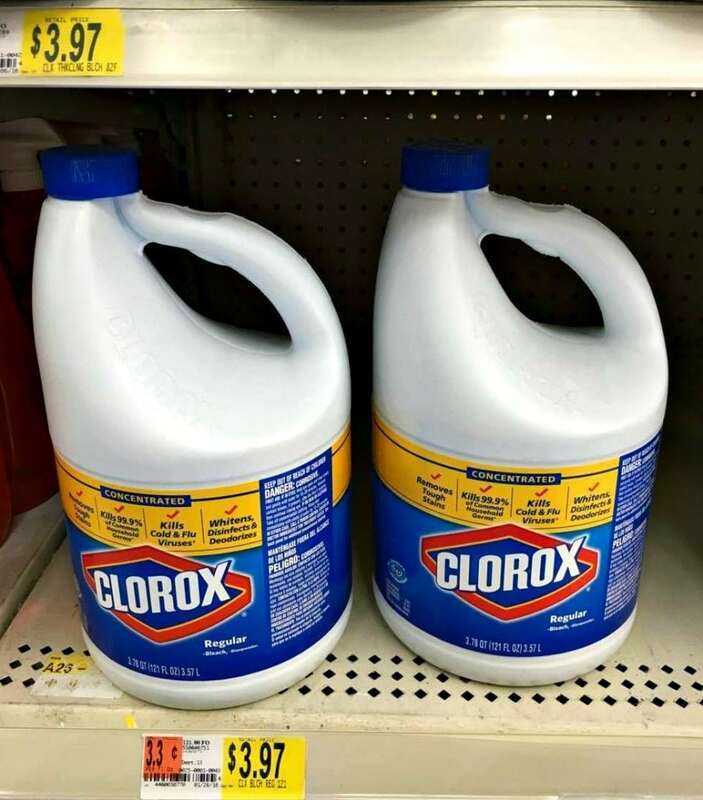 Ever since I was a little girl I have associated cleaning with Clorox because my mom used it religiously for cleaning the house and I learned many tricks that I am going to share with you today. With Spring just around the corner there are all different kinds of flowers popping up, and that has definitely motivated me to have as many as possible around my house too! 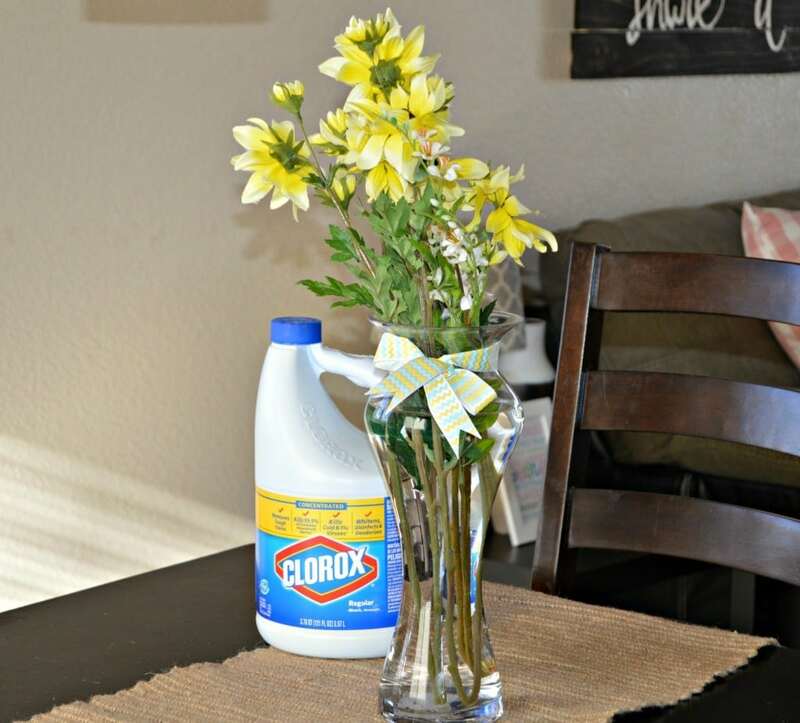 Did you know that if you put 1/4 teaspoon of Clorox per 1 liter of water in your vase, the water will stay fresh longer and it can help avoid the bad odor that flowers let off after a few days? Try it! 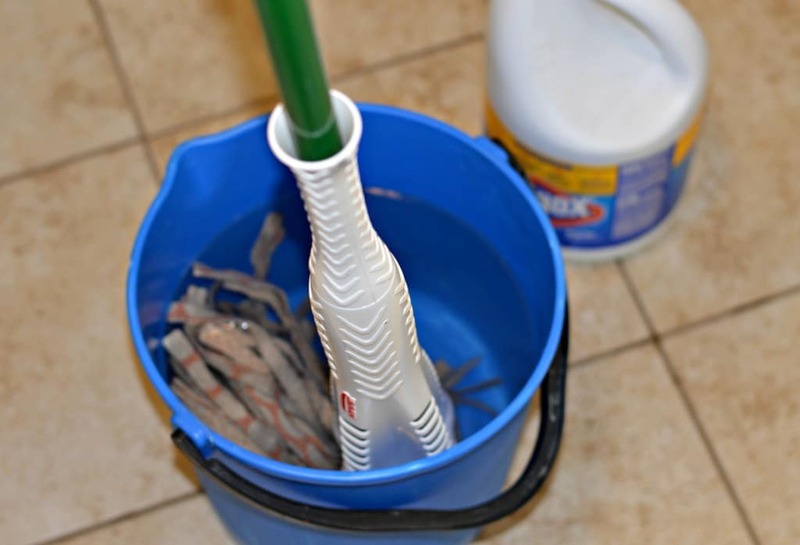 To keep your mops clean, fill a bucket with soapy water and 1/2 a cup of Clorox Liquid Bleach per gallon of water. Next put the mop in the bucket and let it rest for about 5 minutes. Finally, rinse with clean water. When you are done, refill the bucket with the same amounts of water and Clorox Liquid Bleach mentioned above, and add one cup of Pine-Sol Lavender to clean your tile floors. 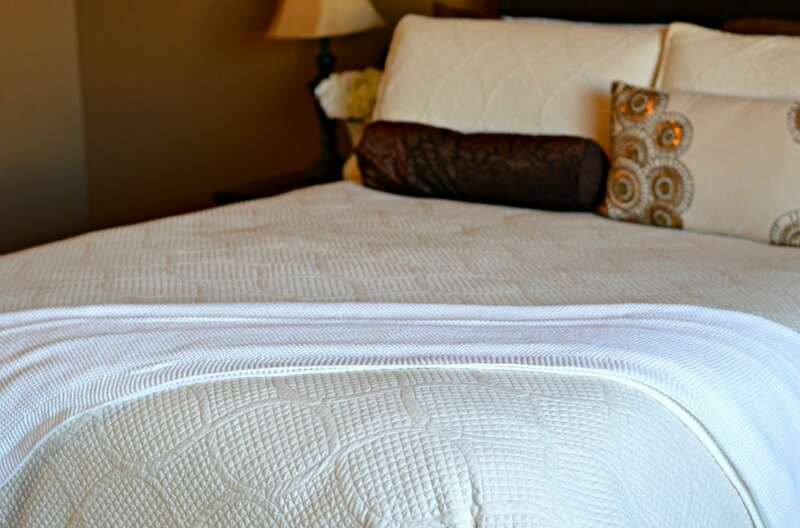 I love using light colors, like white, for the sheets and comforters on my bed because it makes me feel comfortable and clean. However, having two little boys that climb up on our bed every morning makes it hard to keep them that way or long. So, I always make sure to include Clorox Liquid Bleach when I am washing them to keep my whites bright. Like I mentioned above, I have two little boys, and they love playing with small toys like LEGO’s, blocks, and more. Now that there has been enough sun to play outside, they just love taking almost all of their toys outside to the sandbox. Of course they then love to bring them inside covered in sand and who knows what else! Just thinking about the germs that these toys must pick up outside scares me a little bit. 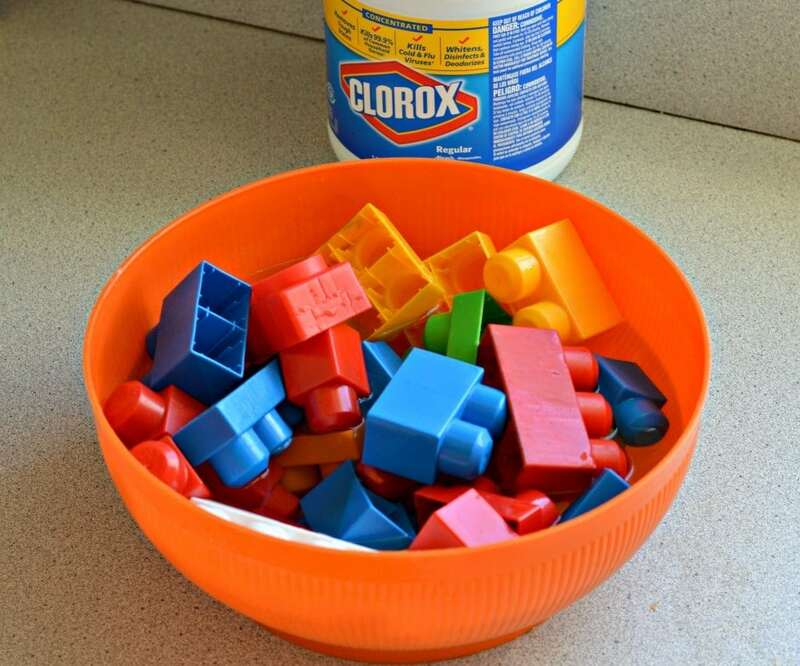 So, in order to try to keep them from catching those germs, I clean them by adding 1/2 cup of Clorox Liquid Bleach to 1 gallon of water, then I add the toys and let them soak for 5 minutes, followed by a good rinse. Finally, I let them dry completely in a strainer over a large bowl or bucket before returning them to the toy box. With everything that has to get done in the morning, I usually put on my makeup pretty quickly which doesn’t leave me with much time to clean up. 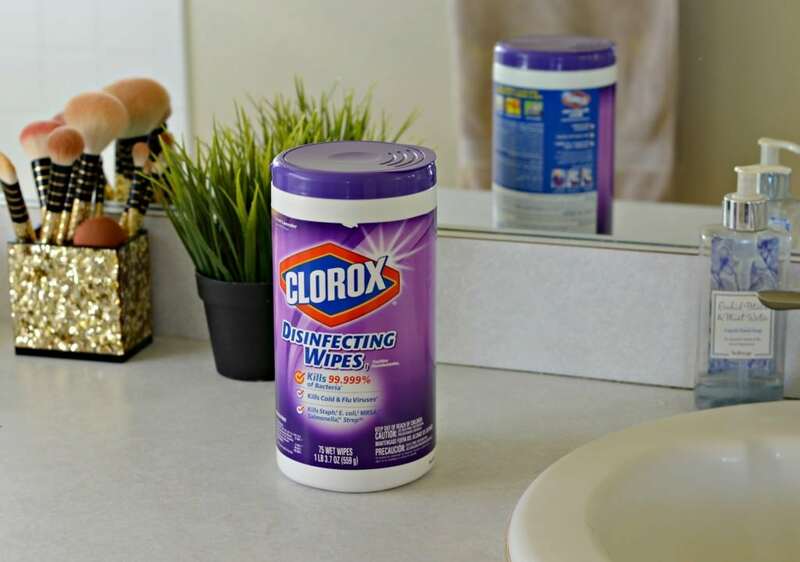 Since I am a bit obsessive about having everything clean, I always make sure to save time by using Lavender Clorox Disinfecting Wipes to quickly clean up the makeup stains from the bathroom surfaces. 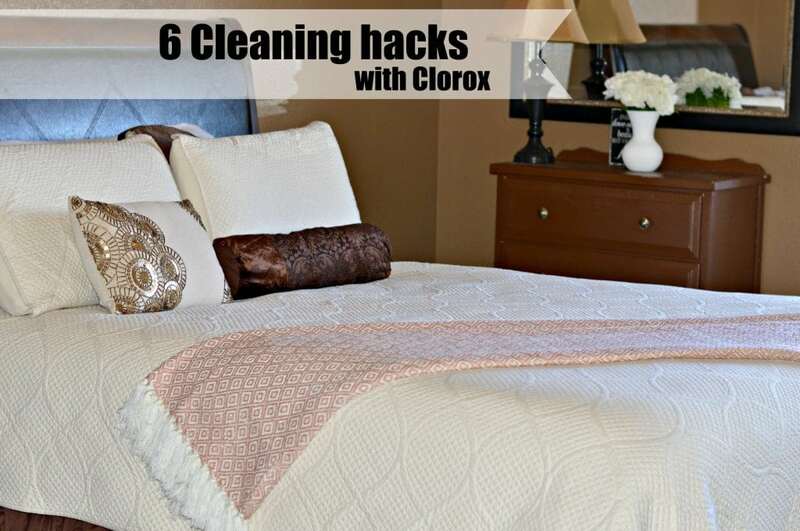 I love this, because not only do I know that it the surfaces are clean, but that they are disinfected too because Clorox Disinfecting Wipes kills 99.9% of household bacteria in your home. I often find little fingerprints around the house – especially on the door handles leading into our snack cabinet! Luckily with the Lavender Clorox Disinfecting Wipes in the kitchen, I can clean them up. As a bonus, the great lavender scent leaves it smelling fresh. Every once in awhile it is important to clean your trash bins, both inside and out. 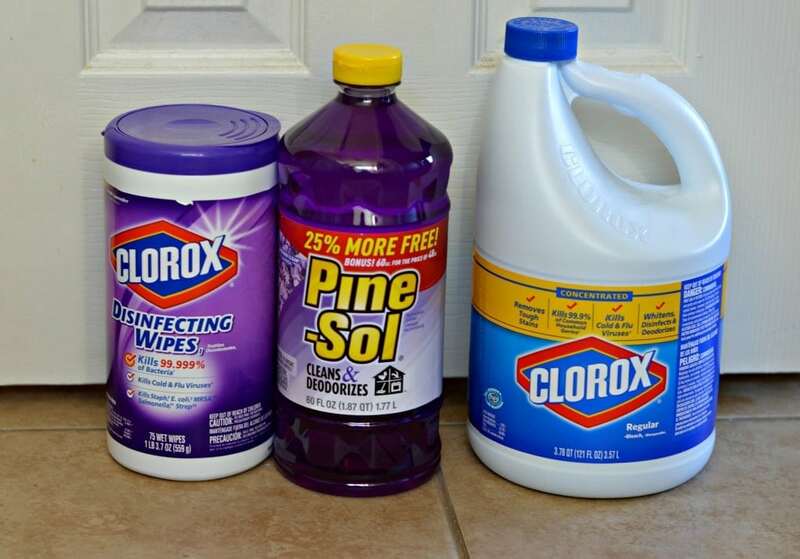 To do it, mix 1/2 cup of Clorox Liquid Bleach with water and scrub it with a kitchen scrubbing sponge before rinsing with a mixture of water and a little bit of Pine-Sol Lavender and letting dry. 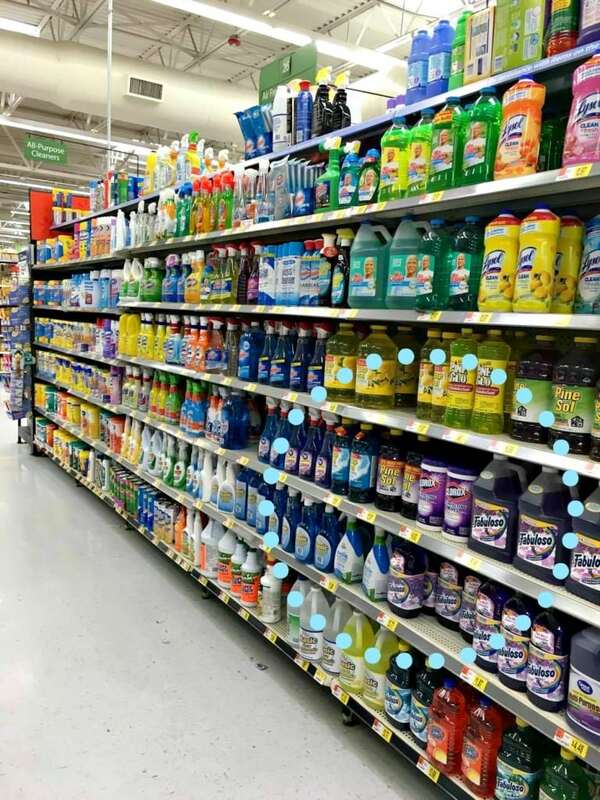 The three products that I mentioned in this post have defintiely been lifesavers for me on more than one occasion, and I am glad that I can find them all so easily in the cleaners section at Walmart. I love learning new ways to clean, so please tell me what are some of your favorite tips!